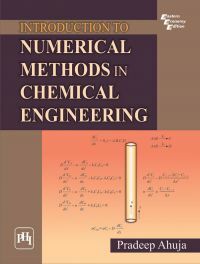 This book is an exhaustive presentation of the numerical methods used in chemical engineering. Intended primarily as a textbook for BE/BTech students of chemical engineering, the book will also be useful to research and development/process professionals in the fields of chemical, biochemical, mechanical and biomedical engineering. The initial chapters discuss the linear and nonlinear algebraic equations. The ensuing chapters cover the problems in chemical engineering thermodynamics as well as initial value problems, boundary value problems and convection-diffusion problems. Topics related to chemical reaction, dispersion and diffusion as well as steady and transient heat conduction are treated in the final chapters. The book covers a large number of numerical methods including tridiagonal matrix algorithm (TDMA) method, Newton's method, Runge-Kutta fourth-order method, Upwind Difference Scheme (UDS) method and Alternating Direction Implicit (ADI) method. Strong emphasis is given on applications and uses of numerical analysis specifically required at the undergraduate level. The book contains numerous worked-out examples and chapter-end exercises. The answers to all chapter-end exercises are provided. The Appendix contains a total of 33 programs in C++ related to the various numerical methods explained in the book. PRADEEP AHUJA, Ph.D., is Reader in the Department of Chemical Engineering and Technology, Institute of Technology, Banaras Hindu University, Varanasi. He has more than a decade's experience in teaching chemical engineering at the BE/BTech level. He has published several research papers in national and international journals. Dr. Ahuja is a recipient of the AICTE Career Award for Young Teachers and a life member of the Indian Institute of Chemical Engineers (IIChE).